Almost all Oregon children can now buy health insurance, as a final phase of the state's Healthy Kids insurance program started last week. The legislature approved the Healthy Kids plan in 2009, funding it through a 1 percent tax on health insurance premiums. Last fall, the program's first phases offered free coverage to children from lower-income families. More than 30,000 kids out of an estimated 65,000 eligible Oregonians have enrolled in that coverage. The final piece of the program, Healthy KidsConnect, lets children from other families buy into the plan, which covers all usual check-ups, preventive care and medical care. The insurance also covers prescription medicine, medical equipment and dental, vision and mental health, including addiction services. Only legal Oregon residents under age 19 are eligible. KidsConnect coverage is sponsored by the state but offered by private health insurance plans. State officials say the final phase of coverage could enroll up to 15,000 children. They aim to have 80,000 children covered through the Healthy Kids program by the end of this year. 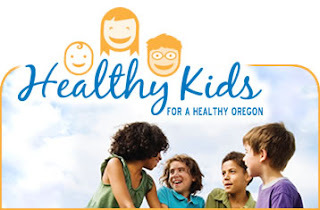 Anyone interested in learning more about the Healthy Kids insurance programs or applying can go online to www.oregon.gov/DHS/healthykids or phone (877) 314-5678. Complete and submit an online application. This form is available in English, Spanish, Russian and Vietnamese. Call 1-877-314-5678 to have an application mailed to you or for information. School Based Health Centers can Help Get Kids Enrolled! 1. Become an application assistor! The Oregon Healthy Kids plan will attempt to enroll 95 percent of uninsured children in Oregon in a quality health insurance product that includes vision and dental coverage. SBHCs are uniquely positioned to locate uninsured children and can help their families get the coverage their kids need to find a health care home. Sign up for the four hour application assistor training that is offered from DHS. •SBHCs (like all other providers) are not eligible to receive the $50 per child successfully enrolled in the program. However, your revenue will increase as you decrease your amount of uncompensated care. •Your school, PTA, service clubs or other groups may be eligible to receive $50 per child successfully enrolled in OHP. Consider asking these or other partners to sign up as application assistors. The Oregon School-Based Health Care Network intends to build a model for expanding Healthy Kids enrollment for children who attend schools with SBHCs. The Network has received a grant from the state to build outreach and enrollment for the Healthy Kids program. Initially, and in cooperation with the Commissions on Children and Families in Washington and Yamhill Counties, the Network will support outreach and enrollment in four high schools. These schools were selected due to the high proportion of students who are uninsured, qualify for free/reduced price lunch, and who reside in communities in which unemployment has skyrocketed since 2007. Our goal is to improve enrollment in these counties, and to share the lessons we learn with SBHCs across the state to develop “best practices” for enrollment. For more information, contact Betse Thielman, Healthy Kids in Schools Program Director, at the Network by calling (503) 813-6400 or e-mailing betse@osbhcn.org.